Silhouette Cameo Ratchet Cap Missing? Check the Machine. I thought that piece looked important. LOL! I was so annoyed that I couldn’t adjust my Silhouette Cameo Blade because I’d misplaced the stupid grey ratchet cap. Annoying!! 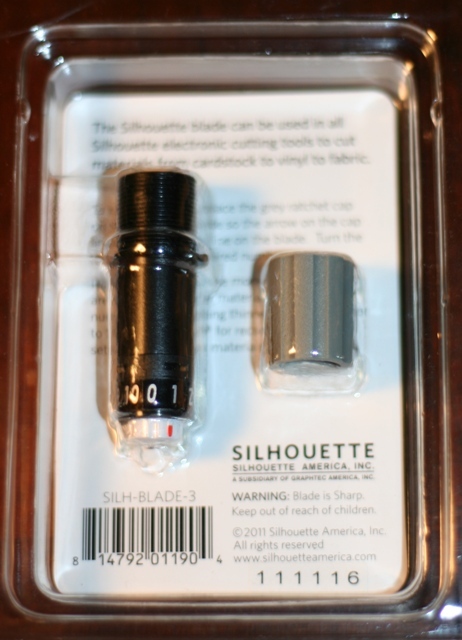 I was griping and stomping around…hollering into the den to DH about how stupid Silhouette was for making a product that can’t easily be adjusted without that dumb grey piece I’d lost. Basically, I was pitching a little fit. That’s when I looked closer at the Cameo and began to wonder…hmmm…just what is this grey round thing that looks just like the ratchet piece I’d lost? I knew that’s what it was for the whole time. I was just testing you. Uh, tell no one I didn’t know. After looking more closely at the machine, I had what I like to call a “DUH moment”. That’s a moment where something that’s quite apparent to everyone finally becomes obvious to me. LOL! It’s a permanent ratchet station. The grey round thing on the inside left of your Cameo IS a ratchet for adjusting the blade. Just put the blade in there and twist. Whew. Dear Silhouette, about calling you stupid…it could have been a slight oversight on my part. LOL! This is what comes in the replacement blade package. See Silhouette Cameo projects here! Need more Silhouette Tutorials? Click here. Wishing You a Fit Free Day! OMG!!! You are soooo funny, but I think I would have been pitching a fit also if I had lost something I needed. LOL!! I'm the same way, especially when I'm looking for a small tool or a certain embellishment that may be hiding in my mess on my craft table! But I try to remember the old advice: Take a deep breath, count to 10, . . . and clean up my mess so I can find my stuff! LOL Glad you found your rachet thing! HAHAHAHA!! I literally laughed out loud. I didn't notice it either. Does that make you feel better??? I had wondered myself at their wisdom of a piece like this that could be lost so easily. You are a life-saver! I just spent an hour looking for my stupid ratchet thing and then found this blog entry through a google search. THANK YOU!!!! Oh man, I don't know how I didn't notice that before! I actually found this blog entry because my blade was stuck and it wouldn't turn with the ratchet thingy(which took me HOURS to find!). Using the one on the machine allowed me to turn it again! Thanks so much! Hi there! I've tried several times to adjust my blade settings with the ratchet. However, it seems as if the blade is stuck. The ratched won't turn :( I may be twisting the cap the wrong way or did not attach the blade to the ratched correctly. Any advice you can share? Ive tried the ratchet cap as well as the ratchet that is on the machine itself. The blade is ruining my mat :( Thank you so much! oh my goah thanknyou so much!!! i never noticed that before! i lost my ratchet and i needed to cut something out for tomorrow... its too bad i already ordered a new blade because i thought i broke mine LOL seriously THANK YOU! Does your machine have a funny little hole on the left instead? If so, that's your rachet :) Instead of sticking up we have ours built in! Just stick your blade into it with the red arrow pointing at you (so straight to the front and turn like normal) Works like a charm! oh my gosh thank you I was wondering about that as well!! you are awesome!! Um, you totally just saved me right now. Face palm. Thank you! Thank you, thank you, THANK YOU for this! I was one of the many who misplaced the cap and was ready to buy a new blade. You are a life saver!